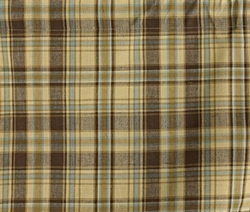 PD 362-49 - Time Worn Tier - 72" x 36"
The Time Worn Tier feature warm colors of tan, beige, brown, and gold with just a touch of subtle teal blue. The Time Worn Tier window curtain topper is designed to be gathered approximately one and a half times the width of your window and matches the Time Worn Valance perfectly. 72" W x 16" L.
Dry Clean for best results and to prevent shrinkage. 1-1/2" header and a 2" rod pocket.